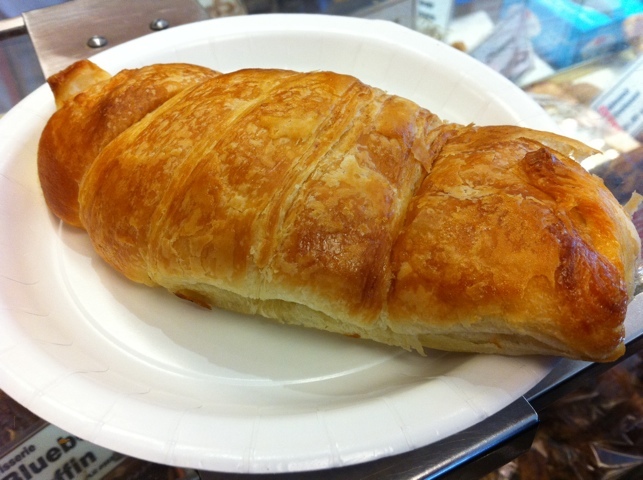 That golden, flaky, buttery croissant pastry is delightful. During recent jury duty it quickly became necessary to grab something early in the morning that I could take on the run. I’d have to be downtown at court anywhere from 9:30-10:30, and I am well accustomed to having to be at work much earlier than that. The suddenly late start threw my rhythm off. Suddenly I had some time to eat something, but not enough to really indulge in a sit-down meal. I used the later start to sleep in – who wouldn’t? 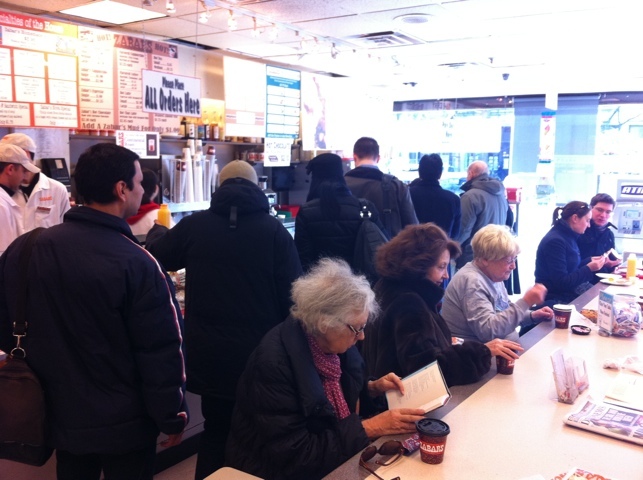 A fairly typical scene at the cafe at Zabar's. Line is long, folks are reading. Since my usual oatmeal wasn’t going to work (no place to sit and eat), it was necessary some days to get something handy like a bagel or some such. 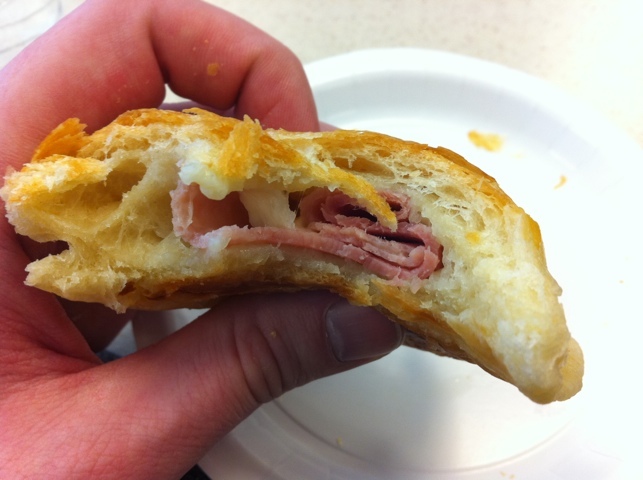 So I stopped in at the cafe at Upper West Side institution Zabar’s, and got myself a decadent ham & cheese croissant. The narrow table is usually filled with coffee drinkers. They are served hot, and if you want you can get them to go in that bag with the metallic lining to keep them warm. I generally opted to devour them then and there, as they only last a few bites. It's like a pinata: nothing suggests the goodness inside. The croissants are pre-made, as opposed to sliced right there and stacked with the ingredients. No, the ham and cheese is encased in them like a pig in blanket. 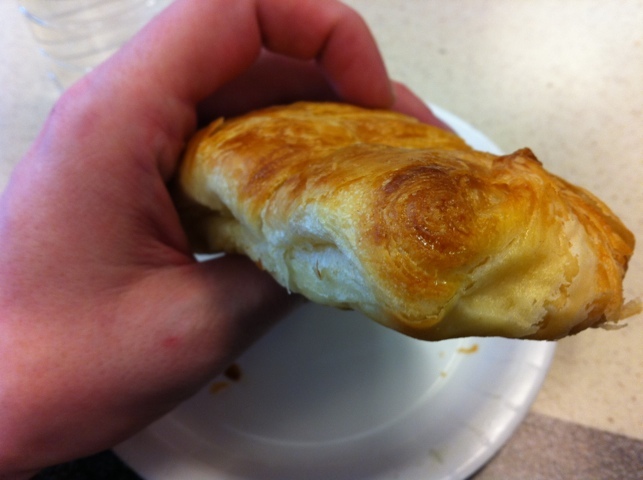 Despite this, the pastry remains quite flaky. Although the cheese is Swiss, it tastes much more like Gruyere, but perhaps that is because it is competing with the rich, buttery pastry and the fatty flavor of the ham. The ham is just a bit thicker than you'd think. The pastry is terrific. As I mentioned they are gone in just a few bites, and you could easily think of devouring two or three of them, although calorie-wise that has got to be a disastrous idea. They clock in at around $3.30 each and are delicious. For a quick, gourmet breakfast to go, they work well.